I am ecstatic that I am a Mom and Adoption Ark made that happen. After two IVF’s and a pregnancy loss of twins at 19 weeks we jumped in to the adoption process and thanks to Adoption Ark my dream of motherhood came true in just three short months. 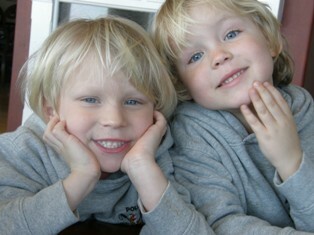 We decided to adopt two children and our two boys (biologically) different are called “twins” on a daily basis. Our boys are our world and I would not change my path or journey to motherhood. I feel that struggling only makes me more appreciative of the gift of my boys. I can remember almost four years ago meeting our boys in the baby house in Siberia and instantly falling in love with Hunter (13 months) with his loving eyes that bonded us immediately. Dylan (21 months) was scared but strong and after minutes melted our hearts… I also will never forget our happiness when the judge told us that our adoption was complete and I was finally a Mom. I was praying I would be a great Mom and hoping that our boys would bond with us and we would be a happy family. My expectations have been exceeded and our bond and happiness immeasurable. Our two little boys are so loving and kind and the love they give not only to us but to everyone is beautiful. “Hunter inspires us daily with his wisdom, compassion and intelligence”. “Dylan continues to be a wonderful, conscientious student who is loved by his many friends”. My sons inspire me to be a better Mom. On this Mother’s Day and every day I am so proud to be Mom to these two wonderful boys and am forever grateful to Adoption Ark. There are so many options when it comes to Adoption but you need to do your research. Your adopted child will be truly blessed to belong to such a big family! I hope you find Mom at Last helpful! I love children, I have 3 of my own aged 16, 18 and 25 I am interest, in adopting a girl aged bween 5 years and 7 years old.